Dave is always hungry. I love to cook, but sometimes his asking me, "What time is lunch? ", drives me a little crazy. I can go for long periods without eating, and even though I know it's a dumb thing to do, I usually eat only once a day. When Dave is home on the weekends, it's "What's for breakfast?. When's lunch? Are we having dinner?". He can eat more food than anyone I've ever met. And, he never gains weight. He has the metabolism of a ten year old. I know, all my feminist friends are thinking, "Why doesn't he cook for himself?". He doesn't cook for himself because I'd really rather do it myself-even if it drives me a bit crazy. He is a disaster in the kitchen, and I am SO fussy about keeping everything just so. Plus, he works hard all week and I (usually) want to spoil him on the weekends. I've become very adpet at whipping up meals in a short period of time-Dave usually wants food when I'm in the middle of working on a 20 page paper, or elbows deep in mud, planting flowers. This is a recent lunch I made him, two of his favorites-pasta salad and an egg and pepper sandwich. I'm not sure if it's an Italian thing, or what, but I grew-up eating egg and pepper sandwiches. My dad used to take me to a little lunch place near his work to get them. I rarely eat eggs these days, but I still make the sandwich for Dave, and I am always reminded of having lunch with my dad in the tiny restaurant, surrounded by construction workers. For the egg sandwich: I saute sliced bell peppers in a skillet with a bit of oil until they are just tender. Then, to the skillet, I add a few well beaten eggs. I turn the stove to low and let the eggs cook, stirring periodically. I season the eggs with salt and pepper, and, when they are just set, I add some grated cheddar cheese. I like this sandwich on a roll or on rye bread best. For the updated version of macaroni salad: Cook 1 lb. of pasta until it is al dente. Drain it and rinse it in cold water to stop the cooking process. 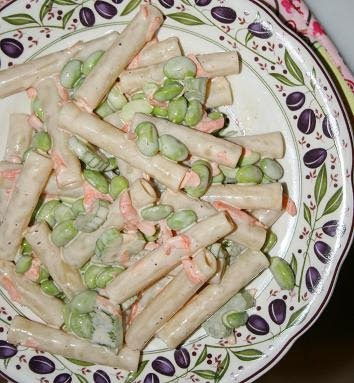 Mix the pasta with a bag of defrosted shelled edamame, some chopped celery, and some grated carrot. Add mayo, a little olive oil, and a splash of vinegar. To season I use: salt, lemon pepper, a little hot sauce, and celery salt. Everything is pretty much to taste. **Please buy organic cage-free eggs. That looks like a yummy lunch! 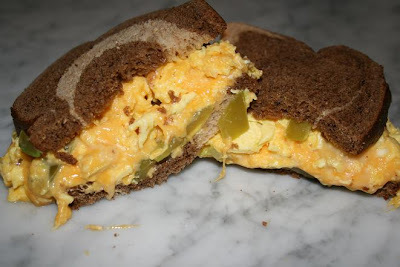 I love egg salad sandwiches but only make them around Easter time. I really need to make it more. And I think that is very sweet of you to cook for your husband on the weekend. You have the right attitude! I agree Dave likes to eat. :) It is amazing how much he eats and never gains, we girls would love to be able to do that. :) I think you spoil him everyday, he is lucky to have you as you are lucky to have him. What was the name of the little lunch place near your dad's work? Is it still there? Cheryl- I doubt if it is still there but I'm not sure. My dad may know the name of it because I can't remember. Maybe Phil will know the name? It was just a couple blocks away from my dad's shop, and it was just a little dive with one guy cooking. Both of Dave's gifts arrived. He will be so excited when he opens them! Thank you! Phil said it was a place called Gus'. He is not sure if the place is still there but he knows Gus is not there any more. That's it! Gus. I have been trying to remember the name. You always pick great gifts-where did you find the cookies?? Online. I just googled them and probably paid too much for them (compared to how much they used to cost when you could readily buy them at the store) but since it is a birthday gift and not available anymore, well worth it. I hope he is surprised and enjoys them. The gift certificate was because he enjoys eating all the foods you make and so he can enjoy his favorite meals. Well, thank you so much for both gifts! I am going to freeze the cookies and dole them out a bit at a time. And, Rainbow Grocery is our dream store. Even Dave likes to shop there because it is all vegetarian-he can eat everything! We have a coupon for 20% off one day this month, so we will do a big shopping.